You know how sometimes you get upset that the people policing your neighborhood are a bunch of fat donut critics who spend most of their time trying to trick you into speeding tickets? It could be worse. They could be Aquaman. Imagine being in a burning building, and the person sent to rescue you shows up in his underwear on a giant seahorse. Or worse, standing on two flying fish with leashes (above right). But don't worry, while you're burning alive, your rescuer has the fantastic ability to TALK with those fish he's using as shoes. You might as well cover yourself in gasoline and try to get it over with quick. 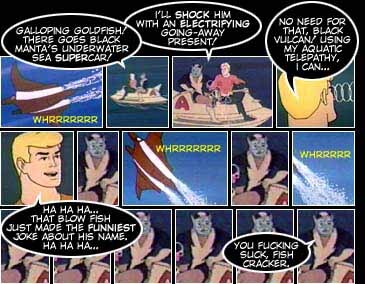 Even if Aquaman's lucky enough to have his existence justified with a fluke underwater adventure, he's still almost useless. Sure, he doesn't have to wear a globe on his head to breathe like his pals, but they can still shoot lasers and lightning bolts. Aqua Man does things like send a school of little fish against a submarine. There are rare times when he remembers he can call something tough like a whale or a shark -- usually when they're in some freshwater lake or a swimming pool. And you don't have to be a marine biologist to know that's fucked up. And that's Aquaman in his element. You get him on dry land and he has trouble vacuuming the house. Don't get me wrong, if you need to find out how much your goldfish enjoys its new flakes, there's no one more qualified. But if you're trying to fight crime, breathing underwater doesn't come in very handy. I've yet to get mugged and have my attacker say, "Give me your wallet and your shoes... UNLESS you can hold your head in this aquarium for five minutes!" 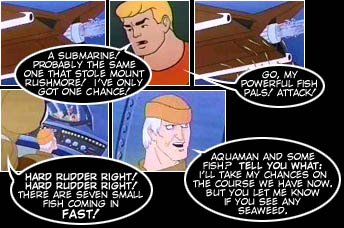 Plus, Aquaman forgets he has powers all the time. He'll be going for a swim, and for no reason, a disgruntled octopus will try to kill him. I guess they hate him as much as we do. So what do you do when an octopus attacks you? Maybe you'd try to get free, punch the thing, or panic until you choke and die. Maybe you'd get out your camera and hope your death can get passed around the internet by bored office workers. Aquaman is the only person on the planet who can just ask the octopus to stop killing him, and it usually takes him 30 or 40 seconds of wiggling and talking to himself before he remembers. And sometimes he never does. Instead of demanding it let go of his neck, he'll call over another fish to bonk it with its head. I've never been choked by an octopus, but I think panicking is probably a better idea than that.